Welcome to the 2016 Official Spotter Guide for the IMSA WeatherTech SportsCar Championship and IMSA Continental Tires SportsCar Challenge races at Road Atlanta, brought to you thanks to IMSA. All four classes compete this weekend in the main event for the WeatherTech SportsCar Championship with the Continental Tires SportsCar Challenge as main support, the final round of the 2016 series. This guide includes the latest new entries and liveries. 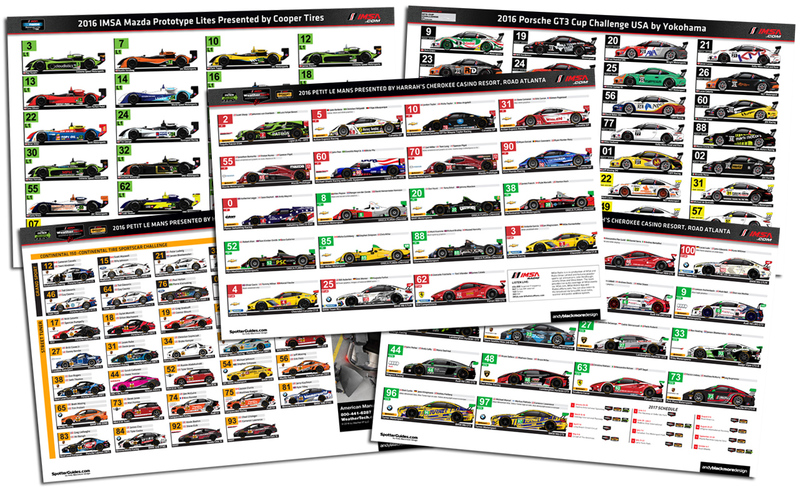 Thanks to commissions from IMSA, every race this weekend has its own official Spotter Guide. 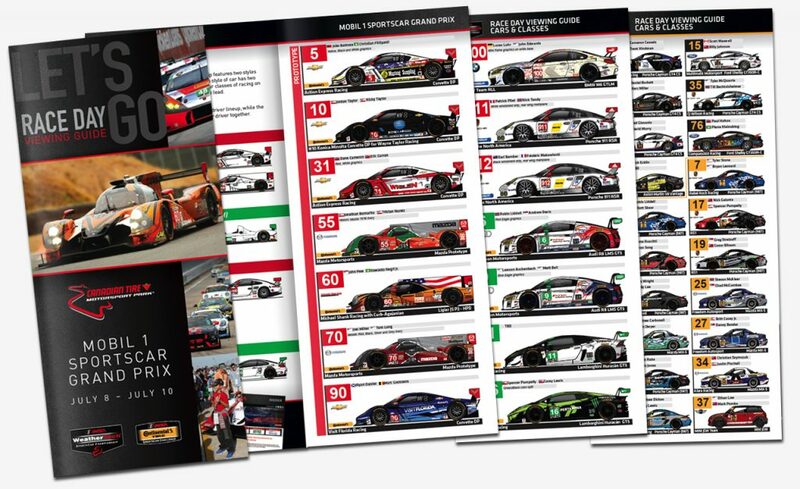 If you are at the event, Andy Blackmore Design and IMSA co-produce a Viewing guide which includes a printed Spotter Guides which is normally available in the FanZone area. Note, This guide go to press 10-15 days before raceday, so it may not be as up to date. A Season-long Spotter Guide T-Shirt and poster is also available from the IMSA Merchandise units. Thanks to IMSA for partnering with the guide, and making it an official product for the eighth year. 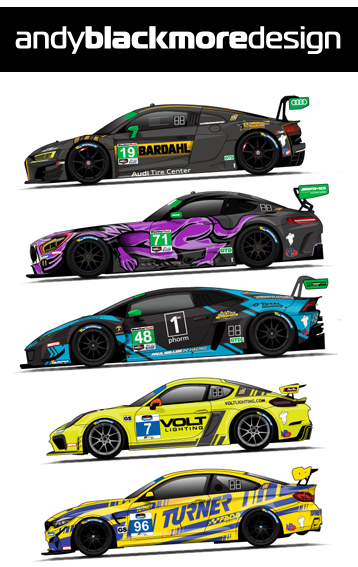 If you get a few seconds, please thank IMSA on Twitter. Without their support, there would be no guide. Massive thanks to the tens of thousands who have downloaded the guide or picked up one of the printed guides at the circuit. Special thanks to all the teams who have helped with the guide this year. Also thanks to the media outlets which promote the guides including RadioLeMans, IMSA Radio, DailySportscar and Sportscar365. 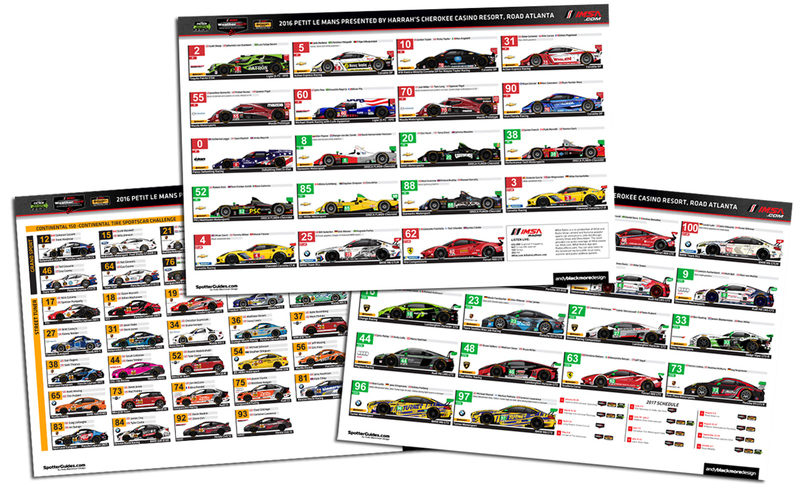 The online Spotter Guide is produced by Andy Blackmore Design.The IMSA Race Day Viewing Guide is produced, race by race by IMSA and Andy Blackmore Design..